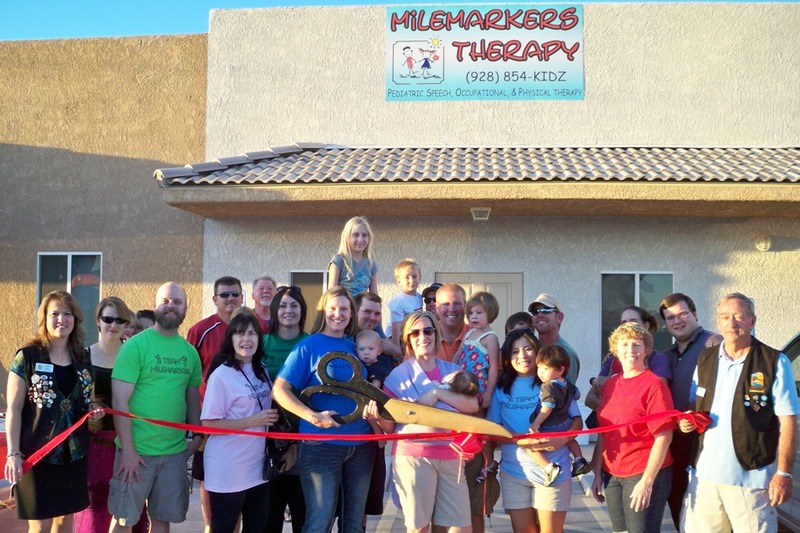 The Lake Havasu Area Chamber of Commerce Ambassadors held a ribbon cutting for Milemarkers Therapy’s 1st year anniversary as a member of the Chamber of Commerce. Co-owners, Colleen McShea and Catie Sondrol are proud to announce their grand opening of their new location at 1515 North Lake Havasu Avenue, #100. Milemarkers therapy specializes in pediatric speech, occupational and physical therapy services as well as the Arizona Early Intervention Program. On hand for the ribbon cutting from Left to right in the front row you will see; Chamber Ambassador Amy Sugamele, Stephanie George, Jason George, Jill Gilbank, Sara Mitchem, Collen McShea, Deegan McShea, Catie Sondrol, Peyton Sondrol, Vijette Saari, Stephanie Kent. In the back row from left to right are; Rick McShea, Emily List, Josh Sondrol, Madilyn Sondrol, Kaito Saari, Damon Saari, LeeAnn Smith, Amelia Smith, Kevin Smith and Chamber Ambassador, Paul Hoyt. For more information please contact them at 854-5439.